Although this home fits neatly on a narrow lot, none of the special touches that make a house a home have been omitted from the plan. This economical home opens to a spacious great room, complete with cathedral ceiling, which receives a warm glow from a strategically placed fireplace. An efficient U-shaped kitchen is open to a well-planned dining area and has access to the rear deck, creating additional outdoor living space. The master bedroom includes a luxurious private bath, and two family bedrooms share a second full bath. 1st Floor: 1362 Sq. 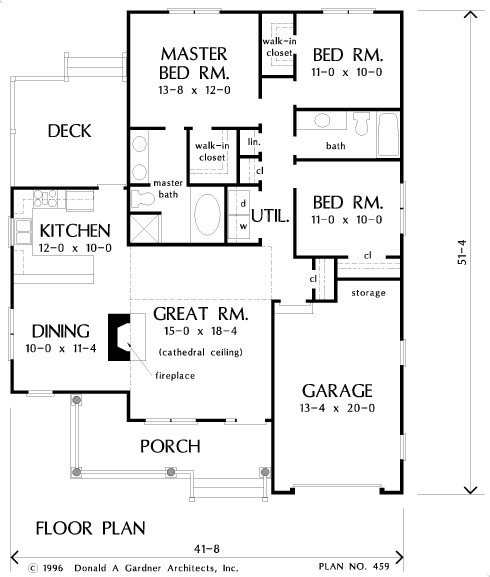 Ft.
House Dimensions: 41' 8" x 51' 4"
Master Bedroom: 13' 8" x 12' 0"
Dining Room : 10' 0" x 11' 4" x 8' 0"
Great Room (Cathedral): 15' 0" x 18' 4" x 15' 10"
Kitchen : 12' 0" x 10' 0" x 8' 0"
Utility Room : 3' 4" x 6' 0" x 8' 0"
Garage : 13' 4" x 20' 0" x 0' 0"
Master Bedroom : 13' 8" x 12' 0" x 8' 0"
Bedroom #2 : 11' 0" x 10' 0" x 8' 0"
Porch - Front : 21' 4" x 6' 0" x 0' 0"
Deck / Patio : 12' 4" x 11' 8" x 0' 0"